The ‘Z-Machine’ is a virtual machine designed in 1979 by Infocom for playing text adventures, and has been re-implemented on nearly every computer and PDA since then. 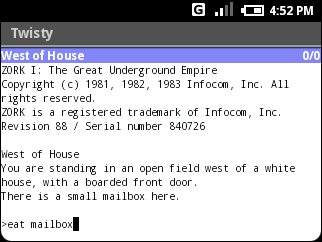 This application allows Android users to play Infocom classics just as ‘Zork’, as well hundreds of newer text adventures written in the last ten years or so. The package comes bundled with a few built-in games, but also allows you to load games from your SD card.